The system is described in a paper in the journal Energy and Environmental Science, co-authored by professors Angela M. Belcher and Paula T. Hammond, graduate student Po-Yen Chen, and three others. It is based on a recent development in solar cells that makes use of a compound called perovskite — specifically, organolead halide perovskite — a technology that has rapidly progressed from initial experiments to a point where its efficiency is nearly competitive with that of other types of solar cells. “It went from initial demonstrations to good efficiency in less than two years,” says Belcher, the W.M. Keck Professor of Energy at MIT. Already, perovskite-based photovoltaic cells have achieved power-conversion efficiency of more than 19 percent, which is close to that of many commercial silicon-based solar cells. Initial descriptions of the perovskite technology identified its use of lead, whose production from raw ores can produce toxic residues, as a drawback. But by using recycled lead from old car batteries, the manufacturing process can instead be used to divert toxic material from landfills and reuse it in photovoltaic panels that could go on producing power for decades. Amazingly, because the perovskite photovoltaic material takes the form of a thin film just half a micrometer thick, the team’s analysis shows that the lead from a single car battery could produce enough solar panels to provide power for 30 households. As an added advantage, the production of perovskite solar cells is a relatively simple and benign process. “It has the advantage of being a low-temperature process, and the number of steps is reduced” compared with the manufacture of conventional solar cells, Belcher says. Those factors will help to make it “easy to get to large scale cheaply,” Chen adds. One motivation for using the lead in old car batteries is that battery technology is undergoing rapid change, with new, more efficient types, such as lithium-ion batteries, swiftly taking over the market. “Once the battery technology evolves, over 200 million lead-acid batteries will potentially be retired in the United States, and that could cause a lot of environmental issues,” Belcher says. 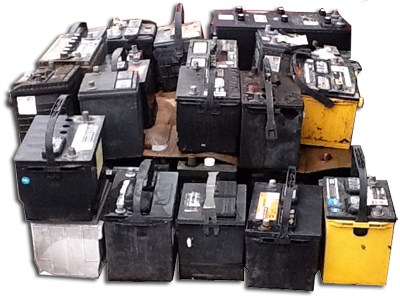 Today, she says, 90 percent of the lead recovered from the recycling of old batteries is used to produce new batteries, but over time the market for new lead-acid batteries is likely to decline, potentially leaving a large stockpile of lead with no obvious application. In a finished solar panel, the lead-containing layer would be fully encapsulated by other materials, as many solar panels are today, limiting the risk of lead contamination of the environment. When the panels are eventually retired, the lead can simply be recycled into new solar panels. Belcher believes that the recycled perovskite solar cells will be embraced by other photovoltaics researchers, who can now fine-tune the technology for maximum efficiency. The team’s work clearly demonstrates that lead recovered from old batteries is just as good for the production of perovskite solar cells as freshly produced metal. Some companies are already gearing up for commercial production of perovskite photovoltaic panels, which could otherwise require new sources of lead. Since this could expose miners and smelters to toxic fumes, the introduction of recycling instead could provide immediate benefits, the team says. The work, which also included research scientist Jifa Qi, graduate student Matthew Klug and postdoc Xiangnan Dang, was supported by Italian energy company Eni through the MIT Energy Initiative.